We’ve been working with creative small businesses, independent designers, and handmade artisans for more than 15 years, and you can bet that when it comes to holiday gifts, our commitment to supporting small businesses carries over. There are so many amazingly creative product-based businesses out there that it was hard for us to choose what to feature in this year’s holiday gift guide, so we decided to narrow it down for the budget conscious! You can feel good about supporting small businesses this year, whether you purchase these unique holiday gifts under $50 for a loved one or for yourself! Suite One Studio – Handmade Porcelain Ring Dish ($32): We love this pretty little navy jewelry dish, splattered with genuine gold. Who are we kidding though, we love all of ceramicist Lindsay Emery’s work! She designed a line of tableware that’s available at Anthropologie and Nordstrom, but for an extra special gift idea, her handmade originals are a great choice. Cotton & Flax – DNA Print Linen Napkins ($28): A set of two linen napkins from Cotton & Flax is a great gift idea for the eco-conscious. The minimalist twist pattern design is inspired by the double helix structure of DNA, and these reusable napkins were independently designed, printed, and sewn in the USA. Molly Hatch – Flower Patch Flower Pot ($20): We had so much fun working with ceramic artist Molly Hatch earlier this year on her new website. You may have seen the tableware collections she’s designed for Anthropologie and other big brands. rayo & honey – “You Are Magic” Pennant ($40): These canvas pennants are made by hand in Brooklyn, New York, infused with the most positive intent that they will encourage and inspire wherever they are hung. Textile artist Roachele Negron combines urban pop-culture, literature & a clean design aesthetic, offering more than 50 different pennant designs to choose from. Nebula Creations Co. – Honey Bee and Comb Pendant ($45): Designer Page Strahan’s intricate paper creations have stolen our hearts! Each of her designs are first hand-drawn, then converted to be laser-cut, and finally layered and assembled together into wearable art, mobiles, and stunning wall art. The mix of metallic, suede, and translucent card stocks used in this pendant is as sweet as honey. Lingua Nigra – Etched Stackable Rings ($27+): Jewelry artist Alicia Goodwin draws her inspiration from nature, with a focus on ancient talismans, Victorian era work and mourning sentimental jewelry. The result are pieces that would look stunning for special occasions, but are infinitely wearable everyday. Mix and match these hand-etched sterling silver and gold plate stackable rings. Treeline & Tide – Waves Earrings ($39): You can feel good about gifting these earrings, because Damian and Jenn Liddiard (the husband and wife team behind Treeline & Tide) partner with One Tree Planted to support reforestation – one tree is planted for every product they sell. We recently worked with Damian and Jenn on a brand overhaul and new Shopify website, and we’re looking forward to hearing about the results of their first holiday shopping season with their new ecommerce store! Tiny Galaxies – Silver Star Glitter Teardrop Earrings ($24): Give the gift that she’ll want to wear all holiday season long! These intricately handmade resin earrings add the perfect pop of sparkle to a New Year’s Eve outfit, but they’d also look great with a t-shirt and jeans. Kate Gabrielle – Future Ex-Mrs. Malcolm Lapel Pin ($12): From Jurassic Park to Parks & Recreation, and plenty of pop culture references in between, Kate Gabrielle’s enamel lapel pins make a super fun gift idea. Take advantage of her “buy 3 pins, get 1 free” deal and load up on gifts for all of your friends or co-workers! Jordandené – Werewolves Not Swearwolves Tee ($35): Celebrate your inner geek in a super stylish, super comfy way with Jordandené’s line of subtly geek-inspired apparel, accessories, and gifts. Each nerd-culture design starts out hand-lettered with a traditional brush and ink. Then the designs are screen printed in Jordandené’s Brooklyn studio onto sweatshop-free tees and tanks. NerdieNifties – El’s Waffles Stranger Things Candle ($6.29): Inspired by Eleven’s love of Eggo waffles, this hand-poured all natural soy wax candle gives off the delicious scent of warm, syrupy waffles. If Stranger Things isn’t your thing, explore plenty of other candle scents inspired by Harry Potter, Overwatch, Game of Thrones, Lord of the Rings, and more. Neutral Ground – Pokémon Mini Map ($40): This mini version of Neutral Ground’s Woodlands laser-etched wood map series offers a detailed glimpse of Professor Oak’s laboratory. If you’ve got a gamer friend who’s gotta catch ’em all, don’t worry, there’s also a full-sized map version of the entire Kanto region. Love, Georgie – Best Dad Ever Cufflinks ($48): These customized stainless steel cufflinks from Love, Georgie are engraved with “best dad ever” on one, and then “love, (the names of your choice)” on the other. Love, Georgie designer Robyn is one of our favorite success stories — she came to us for a rebrand and strategic website design after more than a decade in business. Six months after we launched her new website, her sales revenue was up by 785.21%! With products as charming as these cufflinks, it’s no wonder why. Urban Native Era – Original Keychains Set ($17.99): This set of keychains features two designs from Urban Native Era’s original collection from when they first launched in 2013. Since then, UNE has been working to empower native voices, simultaneously redefining what it means to be indigenous and free. Big Bud Press – Dugout Corduroy Hat ($32): For that guy in your life who can’t have enough baseball caps, a corduroy hat from Big Bud Press is a great upgrade to his collection. Available in 16 different color options, these hats are made in Los Angeles, just like all of Big Bud’s colorful unisex clothing. Rebel Soul Collective – Explore More Duffle Bag ($42): Rebel Soul Collective has gained a cult following on Instagram for their line of tees and accessories featuring empowering messages with a rock n’ roll edge. Just like all of their products, this duffle bag is screen printed locally in Los Angeles, CA. Made from 50% recycled materials, with a reinforced bottom and a detachable + adjustable wide shoulder strap, it’s road trip ready. Petit Mignon – Plush Unicorn ($36): We worked with online children’s clothing boutique owner Amy Wei when she was getting ready to launch Petit Mignon. We helped bring her storybook inspired vision to life via a brand identity, custom Shopify website, print and packaging design, and more. Amy has a keen eye for curating magically playful children’s clothing, toys, and nursery decor. Baby Jives Co. – Luxe Mini Star Cloud Mobile ($30): This personalized mobile is an heirloom quality keepsake that any new parent will be happy to receive. Choose from gold or silver luxe metallic leather for the baby’s initial and hanging stars. Lovelane Designs – Green Dragon Wings ($34): These hand printed, quilted dragon wings will make playtime that much more fun, whether for your own child, a niece or nephew, or a godchild. Lane Huerta’s handcrafted line of capes and crowns have been featured on media platforms worldwide, including The Huffington Post, Today.com, Hooligan’s Magazine, Harper’s Brazil, and ABC World News Tonight. Mouse Loves Pig – Pineapple Baby Rattle ($30): We worked with Ruth of Mouse Loves Pig last year, helping her create a new business name and brand identity for her growing line of infant toys and travel toys for toddlers. This adorable pineapple baby rattle is made from certified organic cotton fabric, and it’s just the right size for little hands. Amitea Organics – Holiday Tea Gift Box ($29): A tea gift box from Amitea Organics is the perfect Secret Santa gift for that office mate who has a fresh cup of tea at her desk on a daily basis. It comes ready for gifting, in a white snowflake adorned box with matching gift tag, filled with 3 types of whole leaf organic teas and a handmade tea infuser. Be sure to order early for the holidays before supplies run out! Brine Hound – Down to Shuck Oyster Knife Set ($20+): A great gift for your favorite shucker, this engraved oyster shucking block and French style oyster knife set can be personalized to feature the monogram of your choice on the knife handle. Brine Hound offers plenty of other clever handmade gifts for seafood lovers. Sweetniks – Matcha Honey Marshmallows ($16): These handmade gourmet marshmallows, crafted with an infusion of honey and fine quality matcha tea powder, make a perfect hostess gift. You’ll be in good company when gifting these sweet treats from Sweetniks – their confectionery clients include Macy’s, NBC, Rebecca Taylor, Google, Lacoste, and Bravo. Justine Gilbuena – Artichoke Enamel Pin ($10): This enamel pin from illustrator Justine Gilbuena would make a sweet stocking stuffer. Based in Queens, New York, Justine started selling her work just a couple of years ago and has gained a loyal following in a short time. You can find her enamel pins, patches, and washi tapes online and at a variety of boutiques around the globe. Yetunde Rodriguez Design – Hand Block Printed Fabric ($18.50+): Textile artist and designer Yetunde Rodriguez creates stunning hand block printed fabric in bright colors and bold patterns. You can purchase her prints as finished products like toiletry kits, pillow covers, and draperies, or give the gift of her fabric to your favorite crafty friend for their own projects. Flax & Twine – Twined Woven Rope Bowl Kit ($28): For those loved ones who are both crafty AND into practical minimalism, this beautiful rope bowl kit from Flax & Twine makes a fun gift idea. It comes complete with 30 yards of pre-cut rope, ready for weaving, as well as a bowl mold for shaping the rope and a how-to PDF. Order one for yourself as well, and turn your gift into a crafty holiday get together! Ann Wood Handmade – Tiny Rag Doll Sewing Kit ($34): Perfect for advanced beginners and intermediate sewers, this kit has everything you need to create a tiny dollhouse-sized rag doll and matching wardrobe. Brooklyn-based artist Ann Wood is a delight to follow on Instagram, and it’s even more delightful to follow along by using her whimsical DIY craft kits and patterns. Pam Powers Knits – Skinny Weepaca Knitting Kit ($31): Last year, we worked with knitwear designer Pam Powers on a brand refresh and a custom Shopify website. She started developing knitting patterns in 2007, and now she offers patterns, yarn, and knitting kits that are perfect for gifting to the knitting enthusiasts in your life! Bonblissity – Lavender Luxury Moisturizing Candy Scrub ($20): We worked with Bonblissity owner Elissa earlier this year to completely revamp her brand’s image. We created new packaging for their scrubs, like the Lavender Luxury Moisturizing Candy Scrub seen here. These single-use, candy-wrapped solid scrubs are great for holiday travel, especially those moments when you’re stuck staying at a family member’s home and you need a bit of solo serenity. Maniology – Kawaii Christmas Manicure Bundle ($47): Another client we worked with in 2018, Maniology offers incredibly fun kits, polishes, and tools for nail art enthusiasts! Their limited edition holiday bundles would be a great gift for your manicure-obsessed bestie, or score yourself some extra BFF points with a subscription to the Mani X Me monthly club. Cheekbone Beauty – Long Lasting Liquid Lipstick ($22): Cheekbone Beauty offers “an Indigenous Approach to Beauty.” Each of the liquid lipsticks from this Canadian made cosmetics line is not tested on animals, features powerfully long-lasting pigments, and is named after a strong and inspirational indigenous woman. 10% of all their profits support equal education opportunities for indigenous youth in Canada. Herbivore – Mini Facial Oil Trio ($29): This travel-sized set of facial oils is ideal for gifting, whether for that friend that’s facial oil curious or the sister who’s a skincare aficionado. Herbivore’s Seattle-made skincare line is vegan, cruelty-free, and free of synthetic ingredients. Snoogs & Wilde – “Stack No.11” Print ($24+): An archival watercolor art print by painter Sarah Martinez makes a great housewarming or holiday gift for someone who loves a bit of color. From her backyard studio in the hills of Northwest Connecticut, Sarah creates both abstract and illustrative paintings, exploring a variety of mediums including acrylic, watercolor and ink. Lisa Congdon – “Permission to Take an Intermission” ($42): We’re huge fans of artist and illustrator Lisa Congdon’s work. In addition to also being the author of seven books and an avid cyclist and swimmer, Lisa recently opened a new retail shop in Portland, Oregon. Her art prints make a great gift for someone who needs some extra inspiration in their life. Tabitha Bianca Brown – Mother and Daughter Print ($20+): The family that reads together, stays together. This professionally printed archival quality art print is created from artist Tabitha Bianca Brown’s original work, mixing digital hand drawing and vintage images. Katharine Watson – Block Printed Holiday Cards ($5): We designed and developed a custom Shopify website for printmaker Katharine Watson earlier this year, and we’re so excited to hear about the results of her first holiday shopping season with her new website. Each of her holiday cards are individually printed with a hand-carved linoleum block, on an antique printing press in Katharine’s studio in Portland, Maine. Sugar Paper – Jingle All The Way Card ($6): Stationery studio Sugar Paper is well known around Los Angeles for their two brick and mortar locations, and we were excited to help them translate their L.A. in-store experience to a new online flagship store. They offer an extensive array of cards for the holidays and other occasions — we love the festive look of gold foil paired with bright white paper and a red envelope! The Mincing Mockingbird & The Frantic Meerkat – Cat’s Christmas Holiday Card ($4): Married artists Matt Adrian (The Mincing Mockingbird) and Kim Bagwill (The Frantic Meerkat) have specialized in creating hilarious yet beautifully designed greeting cards and gifts since 2008. This cat-themed holiday card is a perennial best-seller. Nicely Noted – Letterpress Holiday Card Set ($20/month): Nicely Noted curates beautiful collections of letterpress cards by independent designers. A gift subscription to their service is a perfect way to say “thank you” to that one friend who never forgets to send a handwritten card for every occasion. In search of more unique holiday gift ideas? We hope you found a few new-to-you independent designers in this gift guide, but if you’d like to explore further, never fear! Last year’s holiday gift guide offers up plenty more gift ideas from our team’s favorite small businesses! 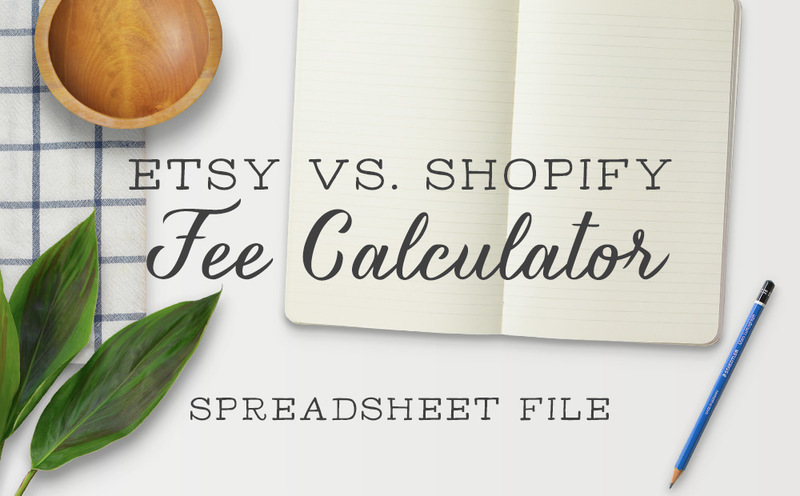 Calculate your Shopify fees vs. your Etsy fees to see which is a better choice for you. Awesome! Your free fee calculator is on its way to your inbox. What an awesome gift guide! I’m happy to support artists and makers and can’t wait to add a few things to my list. Also, I’m honored to be on the list as well. THANK YOU. Happy Holidays All!! Thanks Christa! We were happy to feature you, and we’re glad you like the gift guide! Thank you Jordan! We appreciate the kind words!